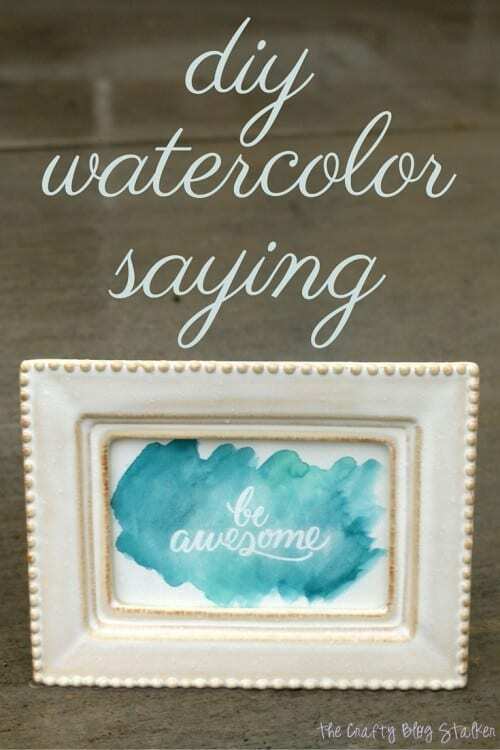 Paint a beautiful inspirational watercolor saying. 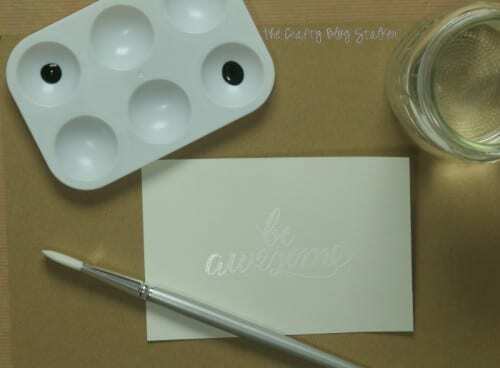 A simple DIY craft tutorial idea that will show the easy way to watercolor. The watercolor look is very popular and trendy right now, and I can totally understand why. Watercolor images are beautiful! Right now the trend is to have the watercolor behind an image or an inspirational quote. 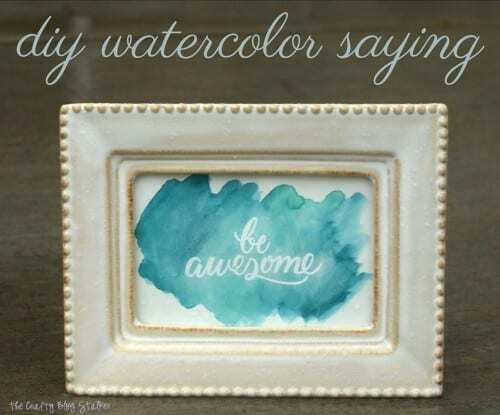 I thought it would be fun to show you how you can create your own beautiful watercolor sayings. It is easier than you may think. I cut my sheet of watercolor paper into a 4×6 inch square because I want to put the finished piece in a frame. Ink the stamp with the Versa Mark ink pad and stamp onto the watercolor paper. 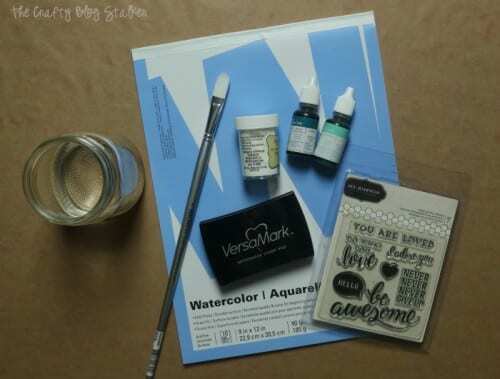 The Versa Mark ink makes it so the embossing powder will stick to the stamped image. 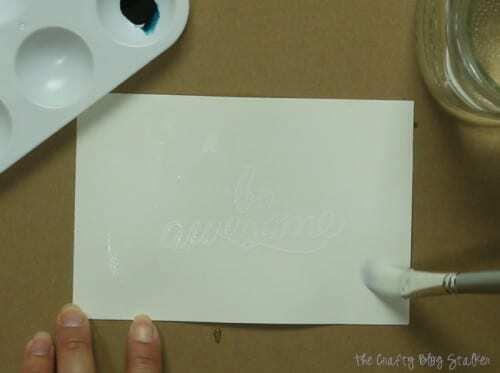 Without wasting too much time, pour the embossing powder over the stamped image. I use a Craft Tidy Tray so that I can easily pour the unused embossing powder back in the jar. Then knock off the excess by tapping on the back side of the watercolor paper. You will be able to see how the powder is only sticking where you stamped your image or saying. Use the heat gun and run it over the embossing powder until it starts to melt together. It will make your stamped image embossed with a glossy texture. 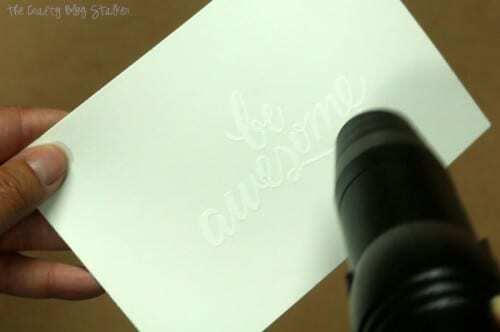 Embossing powder is really cool and makes any project look much more professional. It is a really fun product! Now you are ready for water coloring. Don’t be nervous, you don’t need to be an artist to be able to do this. It is super easy. Plus, water coloring isn’t supposed to look perfect. It is supposed to look a little messy! For my paint, I used two shades of blue from ink pad reinkers and put a couple drops into a small paint tray . Since we are “water” coloring you will want to make sure you have a jar of clean water to mix with the ink. Start by getting your piece of watercolor paper pretty wet. 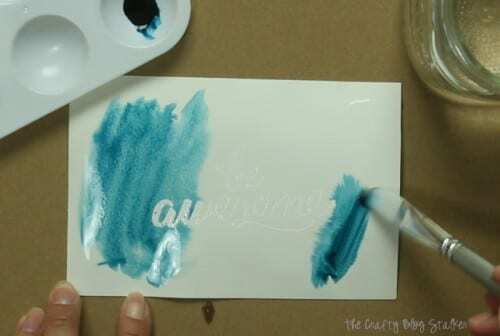 Keep in mind that the ink will spread to all of the wet areas so don’t wet the entire sheet, but you will want to put a heavy coat of just water first. I like to work dark to light, but that is just my personal preference. Wet the paintbrush more and dip the tip into the darker color of ink, and paint your paper. It is really cool to watch the ink spread. For my saying I wanted to have the two sides dark with the center a lighter color so I painted the left and right sides first, and then the center with the lighter color blending it into the sides. It will take a bit to dry, but if you would like to speed it up you can grab your heat gun again and speed up the process. When it was completely dry, I put it into this 4×6 frame. I am completely in love with this simple project. Watercoloring is fun and makes me look like an artist, which I totally am not! 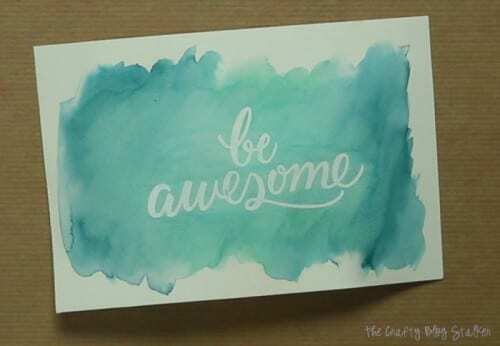 What inspirational quote would you like to put on top of your Watercolor Saying? 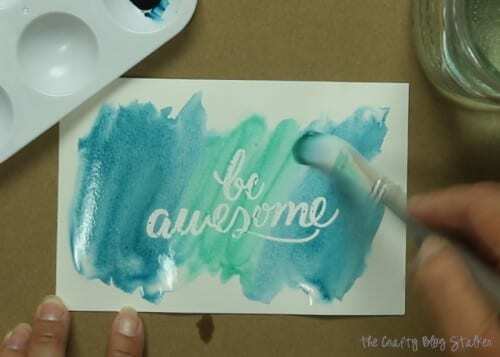 SAVE HOW TO MAKE A DIY WATERCOLOR SAYING TO YOUR FAVORITE PINTEREST BOARD! I love this idea! Such a fun project and there are tons of possibilities for different sayings and colors! this is so cute and easy..i already have whats needed. i might make my grandson a little picture with his name. thank you! Cute project! I love watercolor, and I never thought of embossing the letters before! I love this so much! It’s so pretty and is something I would totally make. Thanks for the inspiration and great tutorial. I would never have thought to use embossing powder. Pinning! How cool is this? It looks awesome and so professional! Can I just say that I’m IN LOVE with this?! I feel like I would pay a fortune for these cute sayings/prints at a craft fair or online! Very cool! I haven’t used some of those materials before. It looks great! I’ve always wanted to know how to do this! What great gifts these would make. Thank you. Love it! And so easy too! Thanks for sharing at Brag About IT! Pinned and tweeted. Thanks Sarah! I am a pretty novice at water coloring but this technique is super easy! What a fantastic and easy way to create unique watercolor art! The possibilities with this are absolutely endless. Love it! Thanks Marie! It really is a fun craft. Do you need to use a heat gun? Great question Denise! Yes, the heat gun is what melts the embossing powder so the watercolor won’t go where the embossing powder is.